Smoke at Inteye Arrkwe 5, 40 x 120 cm. When I had a look at the recent Advocate Art Award – an annual open entry exhibition run by the Central Australian Art Society, shown at Araluen – I stepped back from the individual works to gain a general impression of local artists’ preoccupations. Perhaps no-one will be surprised to find that the dominant two were the natural world, rendered mostly as landscape, and Aboriginal presence, rendered mostly as portraits. There were many quirky off-shoots of course, but overwhelmingly the evidence was of artists living here wanting to, at the very least, represent facets of this place, or to push forward to a better understanding of it and of their relationship to it. Now a show at Raft Artspace takes us on a depth journey into these preoccupations in the hands of a fine artist, Jennifer Taylor, with a long-standing landscape painting practice behind her. The show is the painting component of her doctoral studies in visual arts with Charles Darwin University. 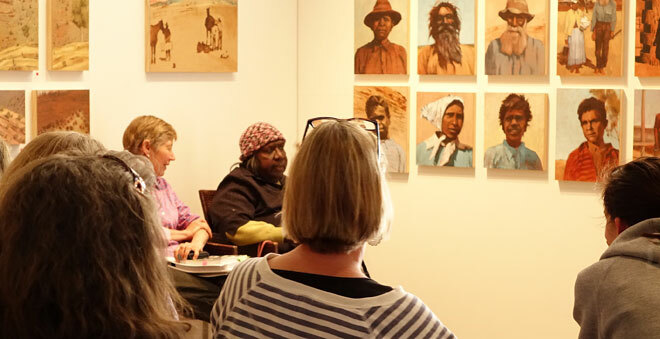 Her enquiry over three years, conducted in Eastern Arrernte country around the present-day Ross River Resort, led her to think about the possibility of painting landscapes as portraits. Could a landscape painting be “as searching and intimate, as full of life and empathy as a good portrait”? Along the way, she took an excursion into what we conventionally think of as portrait painting. Although rendering the human figure and face is not her usual mode of practice, she felt the need to articulate the human presence that haunted the country she was painting in. She found source material in photographs taken in 1938 by a young stockman, Roy McFayden, of his Aboriginal co-workers on Loves Creek Station. Left: Portrait 2, 20 x 15 cm. Today of course, many of these people (and their descendants) are recognized as traditional owners of the country. Their portraits – presented in tight company – provide one of the keys to understanding Taylor’s discoveries. Other keys are provided in her themed groupings of works – around dust, fire, smoke, light, loss, time (time of day and season, historic time and deep time). 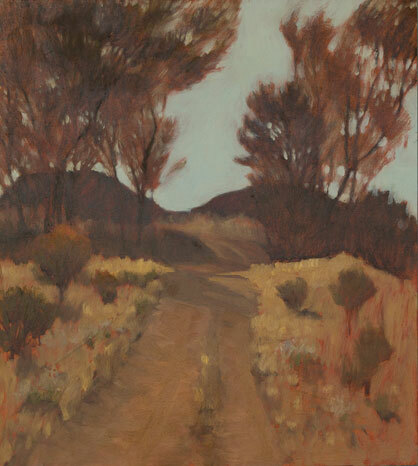 JENNIFER TAYLOR: I can’t shake this apologetic feeling about being a landscape painter. Landscape is seen as a very backward form, as boring. It’s associated with colonial art. There are lots of reasons to question landscape practice. But if you live here and you’re an artist, come on, how can you not be interested? There’s an emotional pull in terms of relating to country, of using that relationship as a way to understand where I stand. Who’s been here before me, what I am doing here, what is our potential in the community for relating to land and to each other? I see landscape as a common ground where lots of those questions can come up. I see it as a deeply political subject and a deeply emotional one. 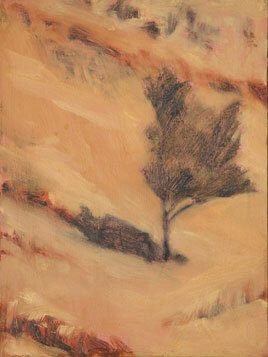 I think of portraying landscape in any way as cross-cultural in itself. I think after going through this process I do now dare to say the practice of landscape painting is a form of caring for country. It’s not equivalent to the Indigenous ways of caring for country but I think it sits alongside that. I think it’s a way of sharing some of those responsibilities. 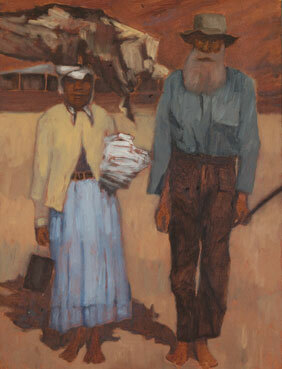 Right: Maggie & Peter Ulyerre, after Roy McFayden, 40 x 30 cm. What that boils down to is that we can’t separate the people from land, including ourselves. In so many ways as non-Indigenous people we’ve done that, over and over, to our detriment, to the point of disaster. Landscape practice can actually start to point that out. There’s a sort of redemptive aspect to it, it starts to bring things together. It has for me and on a community level people have started to come together around this. Taylor hosted a number of in symposiums to explore these questions with people in the community. Among them was Arrernte elder Margaret Kemarre Turner. TAYLOR: It was an incredible privilege to hear from [MK Turner] about Arrernte connections with the place I’ve been painting, unpacking a little bit the mission days and station days. She addressed the portraits, naming the people, bringing those people into the room, sharing that grounding with non-Indigenous people, which was a very generous thing to do. Those conversations in our community are so necessary right now, I don’t mean to say they can wipe out our histories, I wouldn’t even claim that they can heal things but I feel like they’re a place where we are acknowledging that we are standing on common ground, and asking, where do we go now? Symposium on August 3 with Margaret Kemarre Turner: Taylor to her right, the group of portraits after Roy McFayden to her left. Photo courtesy Fiona Walsh. Some of the happiest times I have had in the company of other artists were at Batchelor Institute in workshops with Indigenous artists, where you have such a strong sense that people are coming from their strength in that relationship to place. It’s such a corrective to the kind of relationships between Indigenous and non-Indigenous people where we are helping them make up ground. Relating to people around country is somewhere where I’ve been on the back foot and I’ve been offered those chances so generously to learn how other people are relating to place. Here, of all places in Australia maybe, it is so obvious that the relationship of people to country, while it has taken a battering, is integral and is in some ways more whole. You feel that difference when you move out of this country into places where the land has been more divided up, even more abused. What I most hope is that somehow I can paint in a way that manifests something about that indivisibility of humans and land. If we lose sight of that we really diminish ourselves and run the risk of wrecking the place, if we haven’t already. Taylor was asked about whether she had developed processes, techniques to show that indivisibility. Left: Dust at Inteye Arrkwe 2, 30 x 40 cm. TAYLOR: It’s been a big challenge and people ask sometimes, where are the people in the paintings. I say to myself they are entirely inseparable from the paintings, implicit to the paintings. I might claim that to myself but I can’t say that anyone else will see that. So it’s been necessary to make that more explicit through the writing and through the portraits. But I think it’s a fumbling process. At some point I started to realise that what I was doing was making layers, a permeable ground. You can put paint down but you can see what’s under that. So what I’m putting down in terms of paint is not the end of the story. There’s a sense of it being quite provisional, of there being a relationship between the paint on top and the ground beneath. In the later stages of her enquiry Taylor recognised the unconscious influences of the landscapes of her childhood shaping her perceptions of country. Again she sought to articulate this, with the work After Mark Adams, Indian Island 360 degree panorama, after William Hodges ‘View in Dusky Bay’. As the title indicates, there are two source images: one, by Adams, a 1998 photographic work that returned to the site of the other, by Hodges, a 1773 oil painting, showing an idealised view of a southern Maori elder on an island from the point of view of the arriving colonists. The Adams work, part of a collaborative project with Nicholas Thomas called Cook’s Sites, sought to turn the tables, to look out from the Maori point of view to the bay about to be intruded upon. TAYLOR: I really consciously primed the boards for that one so that there’d be a roughness and a texture showing through, so that … it would be obvious that there’s another landscape underneath, there’s no one story about the land. To me that’s a painting about colonialism, about encounter, about where we stand as non-Indigenous people in Indigenous land, about that layering that exists, different layers of cultural knowledge and history. And it’s partly about the struggle of subjectivity. The mass in the middle of the painting for me stands for that sort of tangle – where am I, what am I doing here, I can’t see through this tangle, trying to explore what it is to be here in this place. Besides that, there’s just the great attraction of the long-range view, you love to see far, to feel that freedom of vision. For me there’s the back and forth, when I’m in country as a painter, between the pressing sense of my own ignorance at times, or incapacity for the job, and then just that joy and pleasure of seeing and feeling. After Mark Adams, Indian Island 360 degree panorama, after William Hodges ‘View in Dusky Bay’, eight boards of 40 x 60 cm. Above the left half of the panorama and below, the right. In this return to roots, it was suggested that Taylor had found a very explicit way to express her ideas, whereas the other paintings remained more open, more exploratory. TAYLOR: The starting point [Adams’ work] was a huge given. The information that I worked off was in a way tighter than when you’re standing outside painting. I hooked on to that subject of looking at colonial encounters but trying to keep an open mind about the results and experiences of those on both sides. All of the other works have been made either from being outside and working plein air or back in the studio working off those sketches. 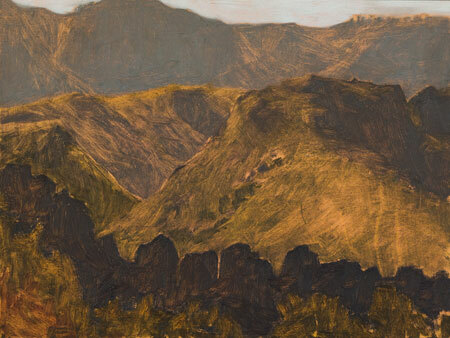 After the tour de force of the Dusky Bay panorama, Taylor painted an imagined submerged Eastern Arrernte landscape. It was as if the Dusky Bay waters had flooded into central Australia. TAYLOR: You’ll recognise the landscape – it’s the range you see from the top of the hill at Ross River, but imagining what that was like when the Inland Sea was there. I was thinking about climate change, about deep time, will there be another Inland Sea in the future, what that might feel like, look like – I spooked myself. I really felt how important water is to me, and how rare it is to se it around here. I felt it was a way to go down, like plumbing some psychological depths that are different when you are dealing with hard ground. Inland Sea, four boards of 50 x 60 cm. When you walk around these places and you think about deep time, it’s a real mind opener – 100 million years ago there was water here, sandstone was being laid down … it gives a very concrete aspect to some of those cultural stories and knowledge about time. It is spooky but also it chills me. It’s a way of extending paintings about catastrophic fires and smoke and so on, a way of saying things are happening here that are spiralling way out of what we can anticipate. We can’t really see where we are going in terms of environmental change. For a lot of people we are living with a heretofore unknown grief about that unpredictability and the losses around landscapes. So it’s hard to know how to paint about that. Apart from catastrophic events, the signs of the changes underway can be quite subtle, especially when the artist is standing back and trying to convey a large-scale view. The viewer, especially one who is not from central Australia, wouldn’t be able to readily identify buffel grass, for example, in Taylor’s work, nor to understand its threat. TAYLOR: My study started with looking at desire, the desire for being there, for beauty and so on. It ran slap bang into the questions of beauty and damage, how they sit side by side, which lead me to looking at MK Turner’s writing about beauty*. It was really revealing for all of us on how we are dealing with the conjuncture of beauty and damage. Things are not going back to what they were, we know that, we have to make our relationship with that. Often it is not wanting to know, which in Buddhist terms is an aspect of desire, the desire to not have something happening. Left: Contiki Camp, 40 x 36 cm. Taylor spoke about painting at Undoolya, before she decided to focus on the one place, Inteye Arrkwe (Ross River). All around her were piles of trash, the buzzing of bikes, people driving in with utes and trailers and coming out with them empty. She was abused by one old man who wanted to chase her from “his spot”. When she looked at the paintings, they were all distant views that sought to block out the things she didn’t want to see or hear. TAYLOR: The desire for things to not be there is so strong that we can easily live with that. This was another turning point. I told myself to muscle up, see if you can find a way to deal with damage. Which lead to the paintings about smoke and fire. But it’s very hard to find a way to picture damage. There are four paintings about dust caused by earthworks at the resort, but the paintings could be read as views by low light. Why did she choose to not show the machinery in the landscape? TAYLOR: It’s not the end of the story yet. But probably it was the desire to keep painting undisturbed. I didn’t realise until I got home that the paintings were full of dust. I think that push and pull of avoidance and approach is there all the time. I found it easier to write about that than to paint it because I don’t want the paintings to be too obvious and didactic. The sense of haunting came up loud and clear when I decided to go to just the one place, Inteye Arrkwe, and paint there all the time. OK, here I stand – who was here before and where are they now? Why is it so quiet now? Why aren’t there any little smokes from little maintenance fires, why is there just this huge smoke? I just stumbled from that to finding out about the people who were working there in the 1930s, through Alec Kruger’s story and Roy McFayden’s story, and working through that I had to make contact with the family, I had to do part of that groundwork. There was comment about different ways of understanding fire, including the Aboriginal concept of fire as ‘cleaning country’. Firefront 2, three boards of 60 x 60 cm. TAYLOR: Visual metaphor is open, it’s uncontrollable, people will see it in their own ways entirely. For me the fire paintings were about the change in fire use and the existence of buffel grass that radically alters the response to fire in the country [because of its much greater fuel load compared to that of native pasture]. We are not going back to the idea that fire can clean country if there’s buffel present. TAYLOR: There isn’t one thing. It’s the endless engagement of it. There’s not going to be a final word. Once you’ve made the work you don’t even know what you’ve done, let alone what someone else is going to make of it. It becomes cultural property, which is great. It gets richer. * In Iwenhe Tyerrtye – what it means to be an Aboriginal person, Margaret Kemarre Turner OAM (2010, IAD Press). Note: All images courtesy the artist and Raft Artspace, except where noted. The medium for all paintings is oil on board. What wonderful paintings, Jenny, and so interesting to read about the process behind their creation! Exploring these themes through a visual medium is extremely thought provoking. I’m sad not to be in Alice to see the exhibition, but thank you Kieran for the opportunity to glimpse something of its richness.